The best fried chicken that I have ever tasted is not a product of hearty Southern cooking — no, instead, it is a succulent and well-spiced gift from Chinese cuisine. Located on 212 Barber Court in Milpitas, California, the Chili Garden Restaurant offers a wide variety of meats and tofu prepared in a delicious blend of chili (among other Chinese dishes but these spicy dishes are what they are known for). 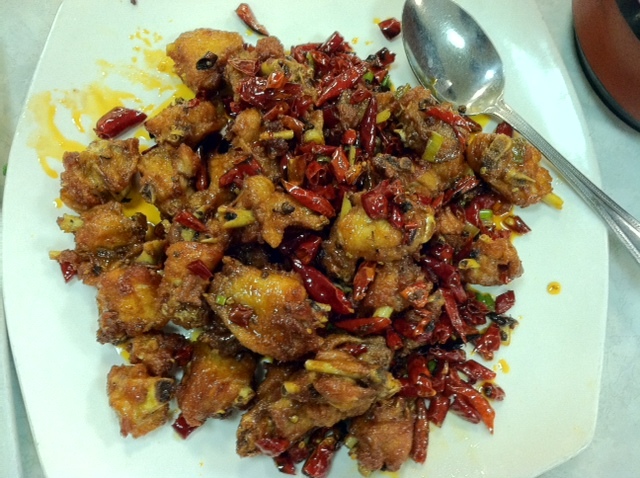 My favorite dish is the Chong Qing Chicken, named after major metropolitan city located in Southwest China. There are several aspects of this dish which make it my favorite fried chicken. The intense spiciness: Often times, you’ll look around the restaurant, and you’ll see people devouring their spicy dishes while their eyes water and faces flush. The nuanced spiciness may be intense but also so incredibly delicious that it is hard to stop eating the chicken. 1. As you can see below, the dish arrives with just as many pieces of dried arbol chili peppers as there are pieces of fried chicken. However, interestingly enough, these arbol peppers (the skinny red ones which are visible in the pictures) are not the main contributors to the spice of the dish. The Chili Garden chefs remove the seeds, generally the focal points of spice in most peppers, prior to using the peppers in the dish. Thus, this first chili component is just a presentation device (and intimidation, for some). The second spice component used in the dish is the Sichuan pepper (which technically belongs to the citrus plant family), the primary seasoning. 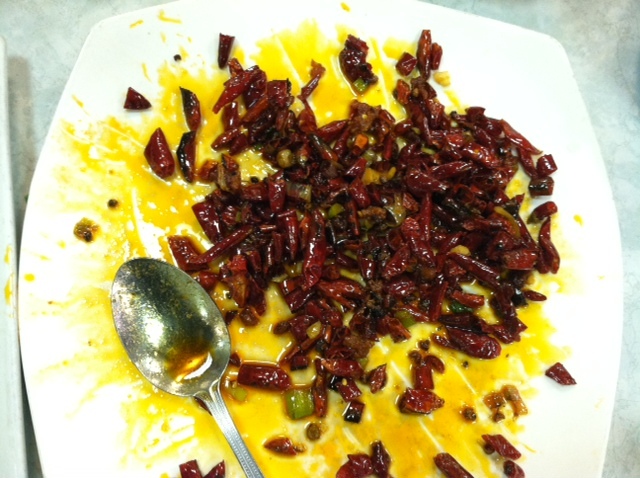 Sichuan peppers have a very unique flavoring: they aren’t just blatantly hot like many other peppers but instead create a tingling and numbing sensation in your mouth. Additionally, there are citrus undertones to its spicy flavor. Sichuan peppers are much more concealed than their counterparts for they are barely visible (each is sightly larger than the tip of a pencil). 2. The frying style: Chili Garden is able to make the dish especially crispy because it double fries the chicken without removing the skin. Additionally, they use peanut oil which is excellent for frying food because it has very high smoke point (meaning you can heat up the oil to a very high temperature without it starting to smoke). An oil’s smoke point is an important consideration when deciding which oil to fry with because the higher the temperature of the oil, the less oil is absorbed in the dish. Frying with peanut oil ultimately results in an incredibly crisp and browned exterior without soaking the inside of the chicken with fat. 3. The chicken: The small size of the chicken pieces ensures that the crisp-to-meat ratio is pretty close to one and also makes this a convenient dish to share. Additionally, they leave the meat on the bone which contributes to a richer chicken flavor than had they stripped the meat off for you. So what are you waiting for? If spicy food makes your stomach growl in anticipation, head on over to the Chili Garden Restaurant and reward yourself with some extremely spicy fried chicken! The Donut: under-represented, belittled as merely a breakfast food, often the victim of foodie scorn and pretension. Maybe some of you will think I should turn in my foodie badge for saying the following, but I think donuts are simply wonderful. They are highly undervalued in the dessert world and are sadly often written off as a convenient pastry to accompany one’s morning coffee. I disagree – and here’s why. For starters, the texture of the donut is unlike most other baked desserts. Cakes tend to be denser while other baked desserts such as the cookie or a bar are usually chewier. Contrastingly, the donut is incredibly airy and light, even though it is fried in the cooking process. Additionally, the fact that the glaze is usually only on half of the donut gives the consumer a varied eating experience: you can alternate bites with the glaze and sprinkles with bites of the underside of the doughnut which has a plainer yet just as satisfying doughy taste. What’s better? If your doughnut isn’t made fresh (which really does make all the difference between a good doughnut and a great doughnut), you can stick it in the microwave for ten seconds and doughnut seemingly melts in your mouth. Furthermore, making a good donut requires a lot more skill and patience than most other dessert. Chances are that you’ve probably made many more cakes than donuts, if ever. Why? It’s a rare skill to be able to make donuts (which are fluffy, sweetened moderately, and perfectly shaped) in your own kitchen. Lastly there are hundreds of different cultural variants for each individual’s tastes. For those too sophisticated to enjoy a donut, there is the French beignet – usually square in shape and topped with powdered sugar and syrup. Or, one may be a fan of the Greek doughnut, also known as loukoumades, which are similar to doughnut holes but are soaked in honey and cinnamon. Surprisingly, the doughnut also makes appearances in Asian cultures. For example, in Northern Indian and Pakistani cuisine, one will find balushahi, fried rings of refined wheat flour. So, have I convinced you that the doughnut should be considered a dessert? Or are you still a believer that the doughnut is a satisfying breakfast food but nothing else? I’d love to hear your opinions! Indian fast food is pretty rare at Berkeley. Sure, there are places like House of Curries and Naan ‘n’ Curry where you can get your favorite Indian dishes to go, but none of them are really “fast food” in the traditional sense of the word. Urbann Turbann, located near the North Gate of Berkeley, boldly defies Indian food norms. Known to many Berkeley Students (and aptly so) as “the Indian Chipotle”, Urbann Turbann is organized in the similar fashion to its (faux) Mexican counterpart — pick a bowl or a wrap, select a meat, choose your vegetables, finish with chutneys. The entire process is just as fast as Chipotle’s (perhaps faster) — when I arrived at Urbann Turbann on a Thursday evening, there were at least 8 people in front of me, but I had my food in my hands in around 15 minutes. 1. The naan was satisfying but largely standard. It was freshly made and had a good balance of a slightly crispy outside with a fluffier interior. Urbann Turbann’s portions are pretty large so if you aren’t very hungry, I would suggest considering getting a rice bowl instead because the naan will get soggy if not eaten right away. 2. The tandoori chicken was nicely flavored and tender. The best part? The sheer amount of meat they put in my wrap. Seriously. The meat-to-everything else ratio was probably around 2-1. Next time I look forward to trying the seekh kabob (spiced beef) for a greater kick of spice. 3. The vegetables were fresh and crisp. I got diced cucumbers, onions and tomatoes in addition to green chiles. My only complained regarding the vegetables is that I wish their green chiles were spicier — I couldn’t even tell my wrap had freshly sliced chiles. 4. The chutneys (“Indian salsas”) — I chose three different sauces: first, the hot mint and cilantro, which, to anyone who is familiar with Indian food is the classic green sauce served with most Indian appetizers. This sauce is nice because the mint adds a certain freshness that is hard to achieve in most other shops. The second sauce I tried was fiery tomato, habanero, and cumin chutney. This was rather disappointing — either there was not enough in my wrap or it was not actually spicy (given that it has habanero chilies, I am guessing that this is likely not the case). Lastly, I tried “mild coconut”. This was a confusing “sauce” given that it appeared more to be shredded coconut rather than an actual sauce, but it still gave the flavors of the wrap another dimension. All in all, the sauces were hit and miss. Next time, I will definitely ask for more of the sauces and hope my wrap turns out to be more adequately spicy. The traditional hot dog and pretzel stands are no longer part of mainstream New York culture. 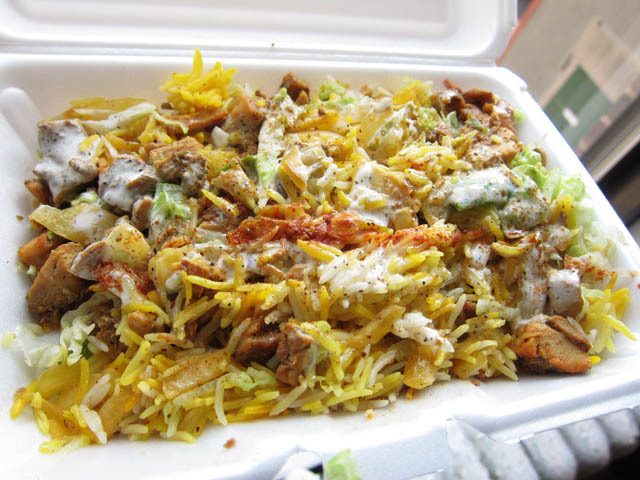 If you walk the streets of NYC today, you find endless amounts of halal carts. Although the cheap prices for lamb and shrimp from street carts may seem worrisome, don’t be silly. 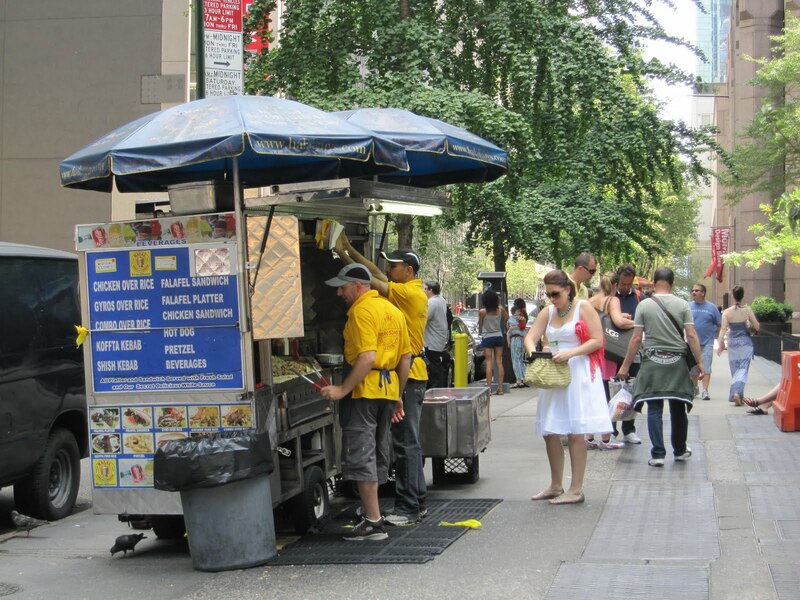 Halal carts are abundant for a reason; you should eat at them as much as you can. If you ask almost any New Yorker, they will immediately bring up the 53rd and 6th cart, truly the “mecca” of New York halal food. This cart does sell their own t-shirts and have their own websites. Sadly, I have not been, so I can not make a judgment so far. However, there is another great option for those who live a bit further downtown. This fantastic cart is located on the southeast side of Union Square. The absurd number of halal carts on 14th Street make it difficult to find. Here are some basic steps for identifying it: it’s the only one with a $3.99 deal including a drink, it is the 3rd cart from 3rd avenue, and the guy running the stand will call you “brother”. Although the gyros are considered favorites, go with the lamb and rice. The lamb, despite coming in a large chunk, is surprising good quality and is even leaner than the chicken. Although thousands of carts offer lamb and rice, this one if different. First, it comes with potatoes on top. The potatoes are chopped up and have a bit of spice on them; they taste very similar to those used in Indian dosas. Second, they put pita on top of the lamb and rice, without extra charge. As always, the pita is coated in butter and the famous New York halal “white sauce”. Third, it costs only $3.99. If you want a lot of great food for only $4, there is no better option. The Epicurious Garden, reminiscent of San Francisco’s much larger Ferry Building, are are cluster of classy take-out eateries (seemingly an oxymoron? read on) located in Berkeley’s Gourmet Ghetto. It’s dining options include freshly made sushi, high end chocolate, and a Chinese restaurant which serves deliciously chewy hand-pulled noodles made-to-order. The most unique aspect of The Epicurious Garden is that even though most of the individual eating places do not have their own dining area, there is a zen garden behind the building which offers plenty of shade and ambiance to those who wish to eat their food on the premises. Lush Gelato is a great place to visit with a group of friends because of its diverse selection. It offers lighter fruit flavored sorbets as well as richer cream-based gelato and has tempting flavors for the adventurous (think Cilantro and Chocolate Chips or Olive Oil Gelato). So next time you’re craving a cold sweet treat, Lush Gelato is sure to please. The majority of newcomers to Berkeley fall into two categories: those who adore boba, the popular Asian drink, and those who are soon to be introduced to it and quickly fall in love. The term “boba” refers to the chewy black tapioca pearls which can accompany any wide variety of teas (ranging from the classic milk tea to more exotic flavors such as passionfruit green tea). To those unaccustomed to the drink, the combination of the two may sound odd, but the tapioca pearls add an enjoyable texture to the already satisfying experience of drinking a fragrant, chilled tea. As far as boba options are concerned, Berkeley may as well be one of America’s boba capitals. The choices are seemingly endless and can be easily puzzling to a newcomer to the area. Here’s a guide to lessen that confusion and to direct you to the boba establishment that is best for you! 1. Quickly’s (located in the Asian ghetto) – The best selling point of Quickly’s is the quality of the tea which is smooth-textured and consistent in its flavoring. Quickly’s also has a great location because it is among varied eating establishments, making it a convenient stop for someone who is planning to pick up dinner and some bubble tea. My one complaint about Quickly’s is that the actual boba that is put into the drink can be sparse, leaving you with a regular tea before you finish your drink. 2. Lotus House (located near Cafe Durant) – Lotus House is a Chinese restaurant that offers limited flavors of bubble tea. Sometimes its quality of the tea is not as good as Quickly’s because it often has a slightly grainy texture, indicating that it has been made from a powder. However, Lotus House surpasses all the other options in regards to how many boba they put in each drink; on several occasions, my drink from Lotus House has almost been half-filled with the delicious tapioca pearls. 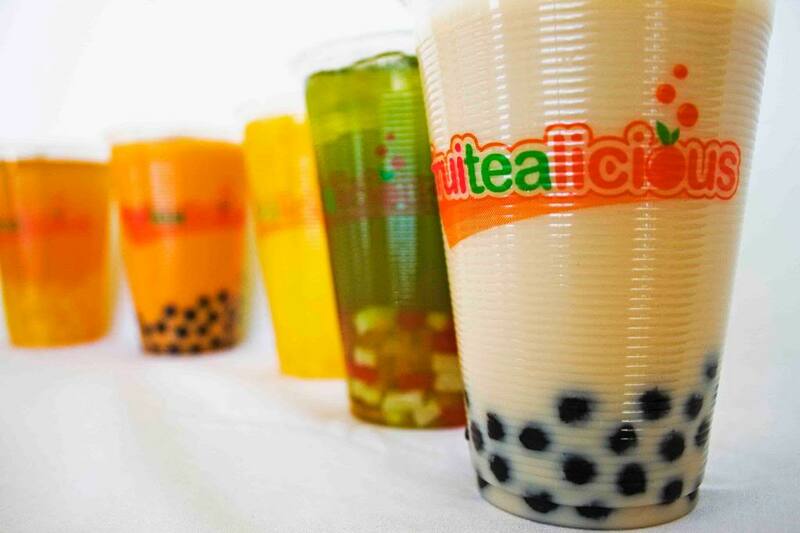 All in all, if the main appeal of drinking bubble tea is its chewy tapioca, Lotus House is your best option. 3. Sweetheart Cafe (located adjacent to the Asian ghetto) – My experiences at Sweetheart Cafe have been varied. The level of sweetness of the teas often fluctuates, but it usually stays in the range of “enjoyable”. However, Sweetheart does offer many different flavors of the tea as well as “snow bubbles” which are essentially heavily iced smoothies. Another advantage to Sweetheart Cafe is that it opens the latest. Whereas most of the bubble tea shops close around 11 PM, Sweetheart Cafe is often past 2 AM because the owners will keep it open as long as a steady stream of customers is still present. Thus, Sweetheart Cafe is the easy choice if you’re craving boba as a late night snack. 4. Mocchacino (located on Bancroft across campus) – Mocchacino is a convenient place to visit with a friend because their 2 for $3 deal makes them the cheapest boba establishment I have visited. The quality of the tea and boba is generally constant: the jasmine milk tea is deliciously fragrant but the number of the tapioca pearls is on the lesser side. An advantage of Mocchacino is that it offers boba with hot tea for the same price as chilled boba (at every other bubble tea place that I have ever visited, the price for hot boba is always greater). Unfortunately, the wait is can be quite long (once, I waited around 20 minutes for my drink), making this establishment a hit or miss if you are pressed for time. 5. Mandarin House (located in the Asian ghetto) – personally, I found the boba tea at Mandarin House to be disappointing for several reasons. For starters, the tea was cloyingly sweet – to the point that it was difficult to drink. Additionally, the drink was around 50% ice and had few actual tapioca pearls. Perhaps it was an anomaly (seeing as I did not return after my first visit), but because Quickly’s and Lotus House are only a few steps away, there is no need to take the risk.